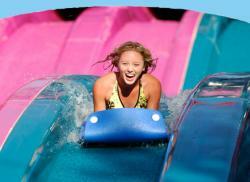 Fun and Adventure this Spring at Adventure Island!!! Hey Guys! Jerm here with a Tampa Florida Attractions update for ya! Adventure Island is now open for the 2011 season, and Busch Gardens’ water park is the go-to destination this spring break. The best way to join in on the fun is with an Adventure Island Weekday Pass, where you Pay For a Day and Play WEEKDAYS All Season. Get a weekday pass and just pay the price of single-day admission and feel free to come back all season long, Monday through Friday. The best part about this is that the Weekday Pass will only set you back $42.99 for both children and adults! What could be better than that you ask? It is valid any WEEKDAY, Monday through Friday, through Sept. 5, 2011! If you like pizza, then for $10 off a single day admission to Adventure Island, visit Domino’s through May 15, 2011, in Tampa, Fort Myers and Orlando to receive a promotion code. Then redeem the promotion code at AdventureIsland.com by May 15, 2011. For more information about any of this, feel free to check out the website! Well guys, that&apos;s it for now but be sure to stay tuned in and update to day on all things to do in Tampa Bay!